actually, today is sunday, and the title was describing the restaurant i just went today. actually my dad lusting over the ribs they sold here. but, when we came, they have none. dad felt really bad and complained in his style (which doesn't really look like complaining after all), the waiter seemed so kind and generously gave us this, for free!. awww, looks so yummy, isn't it? it has almond peanuts, chocolate topping, cherry, caramel and, delicious ice cream! oh geez, i ate them all, by myself. hihi. after that, mom n i went to coffee festival @ wijaya. 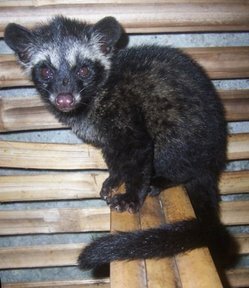 and let me introduce: KOPI LUWAK! so, the salesman told us that it was made from LUWAK'S POO! "yes, here, let me show you"
doesn't look like poo at all, right? next meeting, we should go karaoke fellas! at sency perhaps? the girls n fountain show! omg jo! you're such a freak! hahaha.